A year after Hurricane Irma put a temporary stop to the tradition, Full Moon Dinners are coming back to the Cruz Bay culinary scene. Previously hosted by St. John Catering at their Windy Level Event Center, the tradition will continue on at owner Mathayom’s new restaurant in Cruz Bay, Lucky Chops Lounge. Full Moon Dinners are al fresco dining events each featuring a new theme and menu inspired by and in conjunction with the lunar calendar. Past menus for Full Moon Dinner have ranged from explorations of local cuisine as at the Crucian Collaboration Full Moon Dinner, to bountiful samplings of exotic or unique flavors such as at the Thai One On or Kickin’ Ash Full Moon Dinners. The first Full Moon Dinner to mark the return of this St. John tradition is on Sept. 24th for the harvest moon. 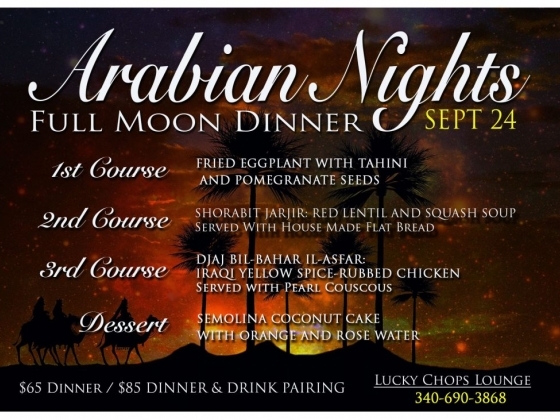 The theme will be Arabian Nights, a celebration of bounty and thankfulness with a meal showcasing Middle Eastern cuisine. Lucky Chops Lounges plans to make Full Moon Dinners a monthly event at their space in Cruz Bay located next to the Catholic Church (in the former Fish Trap restaurant).